Are you tired of walking to the main refrigerator in the kitchen all the time just to grab a drink? Are you forced to carry your drinks inside coolers full of ice every time you travelling? If the answer is yes, then it’s about time you get a mini compact refrigerator. Unlike standard kitchen refrigerator, this unit is smaller and can fit almost anywhere in the office, garage, dorm room or any other efficient space. They can also be used when travelling, camping, tailgating or boating. Furthermore, they are convenient and help you cool your favorite drinks and food regardless of the temperature outside. 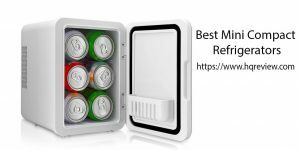 Without further delay, let’s look at top 10 best mini compact refrigerators in 2019. Capacity: When shopping for a mini refrigerator, check out the total internal space and choose according to what you will be storing often. If you just want to store soda cans one with 1.6 cubic feet capacity will suffice. Although it is better to pick larger ones (3.1 cu ft) as they offer you plenty of storage room. Style: The second thing you should consider is the style you want. 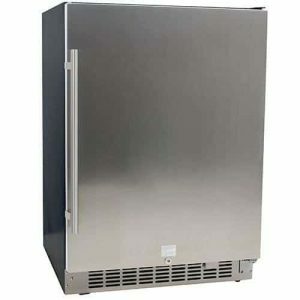 Some come with two sections; refrigerator and freezer section, while others do not include the freezer compartment. Some have painted finishes while other have stainless outlook. Choose the right style according to your preference. Features: Some mini refrigerators come with extra features such as adjustable shelves, ice cube chamber, with or without a freezer, vegetable and fruit basket etc. Choose one that has most of these features as it will be convenient for you. Budget: Consider how much you are willing to spend on your mini refrigerator with quality and performance in mind. Why do you need a mini compact refrigerator? 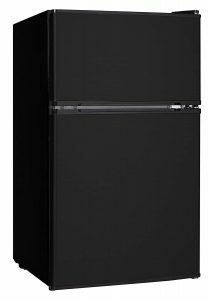 They are efficient: Although mini compact refrigerators are smaller, they offer the best features and excellent performance while still maintaining energy efficiency. They have customable interior: The interior layout of a mini fridge allows adjustments to create extra storage room. Mini Compact Refrigerators are quiet and easy to clean: Most mini fridges are made with cutting edge technology that ensures low noise, temperature regulation and easy cleaning. The NutriChef is one of the best mini refrigerators on the market that offers perfect temperature for cool foods and can also keep warmer foods warm until serving time. It is easy to use thanks to the plug and play design. This compact and lightweight refrigerator has an internal capacity of 4 liters and has removal tray for extra storage space. It comes with wall cable and car charger adapter that allows you to use it anywhere even on road trips. Last but not least you can buy it with confidence thanks to the one year warranty included. 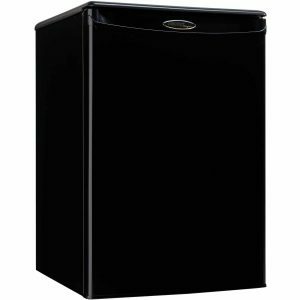 This mini refrigerator has a storage space of 2.4 cu ft and the compact design allows it to fit onto any space in the office, dorm room or garage. It makes storing and retrieving food and drinks easy thanks to the reversible swing door. The in-door storage shelves are perfect for small foods while the adjustable wire shelves allow more space for storage. The thermostat can be adjusted to produce the perfect temperature for your food and drinks and to defrost as well. 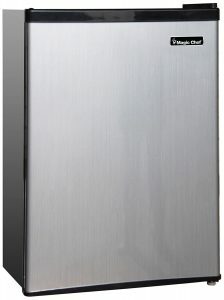 Last of all the stainless look gives this fridge a contemporary look and is scratch resistant. 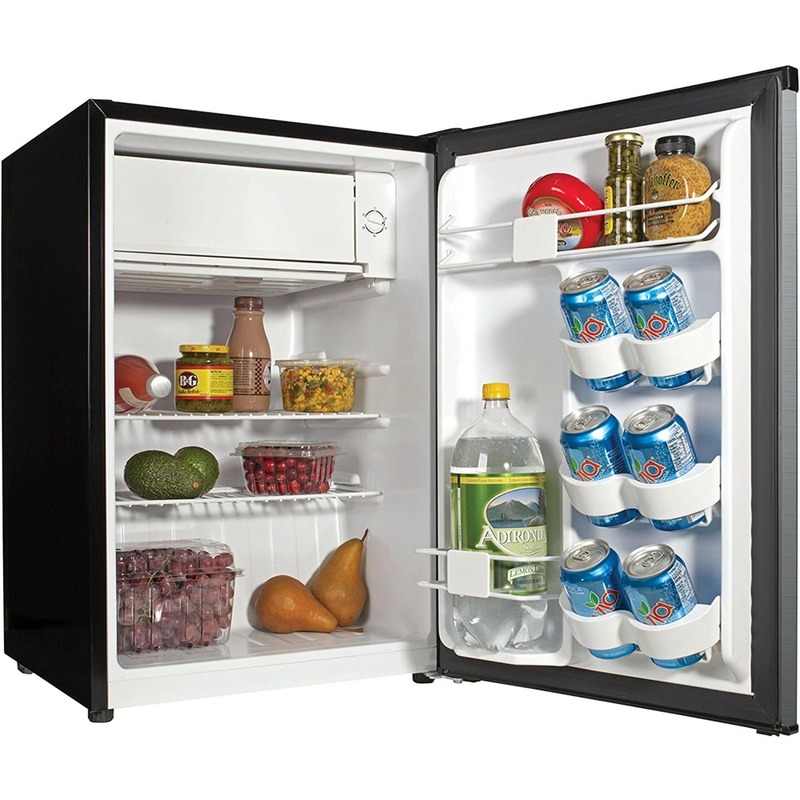 The EdgeStar CBR1501SLD mini refrigerator offers plenty of room to store your drinks and food thanks to its 5.49 Cu. Ft. total capacity. It holds up to 142 12 oz cans which is a lot compared to any other mini refrigerator on the market. This features makes it perfect for game rooms, bar or kitchen as you will never run out quickly of cold drinks for your family and friends. It measures 24 inches across, therefore, it can perfectly fit in any limited spaces. The reversible door features a lock that helps you to keep your drinks safe and is user-friendly to right-handed or left-handed people. 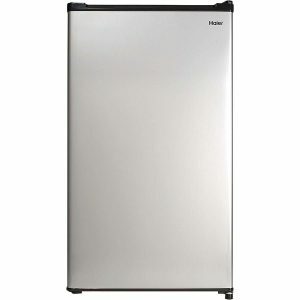 Additionally, the stainless steel door helps to keep your drinks refreshingly cold by insulating the refrigerator. 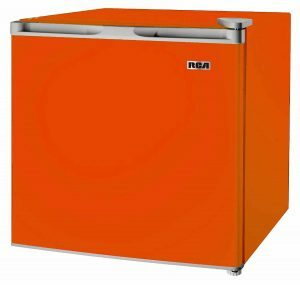 Last but not least, it boast extensive features such as built-in carbon filter, glass shelves, auto defrost, digital temperatures controls and a great compressor cooling system with temperature range of 38-50 degrees F.
If you love color orange then you will love this mini refrigerator. Apart from orange, this refrigerator also comes in colors such as blue, green, blue and white. The interior space has capacity of 1.6 cu ft which is sufficient space for cooling drinks. The reversible door is user friendly to any left or right handed people. It also features an adjustable thermostat that gets your drinks and food the ideal temperature. The door basket can accommodate 2 liter beverage bottle and comes with an ice cube tray too. Lastly it is perfect for use in dorms, bedroom, office and many more locations. The Haier HC27SW20RV mini refrigerator features a sleek design and the silver color blends well with any room and interior décor. 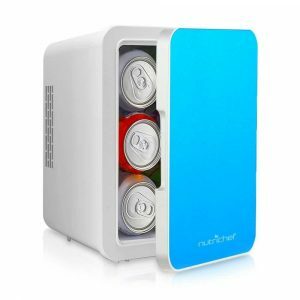 It measures 18.7 inches wide, 17.5 long and 27.4 high which makes this mini refrigerator suitable for any dorm, workout room or office. The best part is that you can make ice cubes with it thanks to the included ice cube tray and freezer section. It comes with 2 wide wire shelves that are perfect for storing small items like soda cans, milk, yoghurt fruit etc. Furthermore, the door can accommodate 2 liters bottles and any other tall beverage containers. Lastly it is backed by 1 year manufacturer’s warranty. 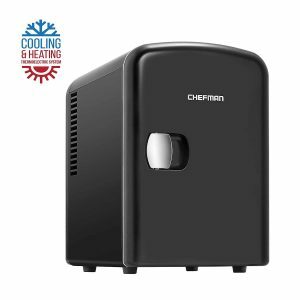 Chefman mini refrigerator is another great unit that has made it to our list. It comes packed with impactful features that will greatly help you in storing your items. Its compact nature makes a wonderful addition to any personal space, office, dorms and can be brought along when travelling, on road trips, boating, camping, commuting or tailgating. It features plugs that can be used at home on standard outlets and12v car chargers when travelling. Additionally, it has a 4 liter total capacity that can cool 6 soda cans and removable shelf that allow you to store small items like milk, fruits, yoghurt and much more. Lastly, it 100% Freon free, eco-friendly and is backed by 30 day money back guarantee and 1 year manufacturer’s warranty. This one of the quietest mini refrigerator on the market and therefore it can be used in nurseries, hospital wards or any other place that needs zero noise. Measuring 19.72 inches wide, 26.1 inches long and 33.86inches tall, it is larger than most mini refrigerators with a capacity of 3.0 cu ft and yet compact enough to be kept on counter tops or beneath office desks. The adjustable thermostat ensures the right temperature is provided for cooling your foods and drinks, and helps on saving energy as well. Additionally, it comes with exciting extensive features such as adjustable leg, reversible door swing, separate wire shelves and a 1 year manufacturer’s warranty in case of any defect. This Midea 3.1 cu. ft. mini refrigerator boast several interesting features such as refrigerator and freezer subdivisions and much more. The 3.1 cubic feet capacity offers enough storage for food and drinks in an eco-friendly manner. Furthermore, this refrigerator features a temperature control panel that monitors how electricity is used consequently you get low electrical costs. Its compact design makes it suitable for various places like offices, bars, dorms and much more. The door swing can be easily reversed to match any space or room layout. The shelving system and lighting allows you to organize your items with ease. Moreover, it comes with a separate vegetable or fruit drawer which is an added advantage. In case you notice any defect within the first year, you can return this unit since it covered by 1 full year manufacturer’s warranty. 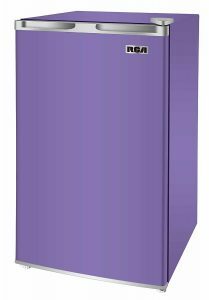 This amazing purple Igloo mini refrigerator features a modern style and is made with the best refrigeration technology. It handles and store food and drinks in an eco-friendly manner. With its sleek design, you will find that it blends with any room that you place it in. The total storage capacity is 3.2 cu ft and this enough room to store whatever you need. The beautiful interior features two adjustable shelves that can be moved to your preference while the door provides extra storage for tall bottles beverages. In addition, the door is reversible for left or right opening. The thermostat is adjustable and allows you to keep your items at maximum temperature. Lastly, it features a can dispenser and freezer compartment for items that need to be stored longer. 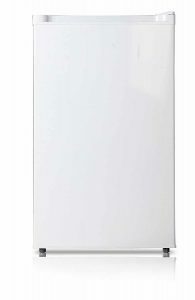 The Danby Mini Refrigerator features 26 cu ft room that is enough space for keeping you drinks cold. Thanks to its low height, you can place it on the counter top or on the floor and doesn’t take too much space. This compact design makes it a wonderful touch up for any room or office space. In addition, it is eco friendly and does not use too much electricity. With this fridge, storing tall bottle beverages is hassle free because of adequate space. The exterior is scratch-resistant and you can freely store accessories on top of it with no worries. Additionally, this mini fridge defrosts itself automatically. It offers 2.5 sturdy wire shelves that provide optimal storage options. Last but not least, this unit is accompanied by 18 months warranty for parts and labor. Mini Compact refrigerators make living easy and convenient. They are handy when you are starting college or when you are living by yourself. They become necessary luxury units when you need to store your drinks nearby or when travelling, camping or when on road trips. It is for this reason that we have compiled for you top 10 best mini compact refrigerators that are not only affordable but efficient too.